Trial was launched in response to a campaign by Labour MSP Monica Lennon. Airport: 'More than happy' to support campaign. 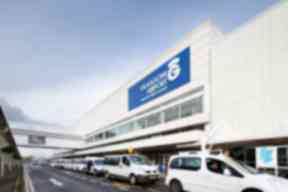 Glasgow Airport is to provide free sanitary products for female passengers. The airport said free tampons and pads would be available in toilets in the main check-in hall as well as domestic and international arrivals. The trial scheme is in response to a campaign by Labour MSP Monica Lennon to end period poverty in Scotland. She has proposed a Bill to ensure free access to sanitary products, including in schools, colleges and universities. Amanda McMillan, managing director of Glasgow Airport, said: "This is an excellent initiative and one which we are more than happy to support. "We met with Monica earlier this year and she highlighted the need to address what is a real issue for many women. "Millions of passengers travel through our doors on an annual basis and this trial will ensure that our female customers have access to these essential products." Ms Lennon said: "I am delighted that Glasgow Airport are backing my campaign to end period poverty. "Providing free sanitary products at the airport sends out a strong message that periods are normal and I know this will be appreciated by passengers. "Getting your period can happen unexpectedly and often at inopportune times - at work, at school, and when you're travelling. "No-one should have to go without access to vital sanitary products, so it's great that Glasgow Airport are leading by example on this issue." In July the Scottish Government announced a six-month pilot project in Aberdeen to provide free sanitary products to women and girls from low-income homes.